Bailey – (Norwich). Per pale az. and sa. a cross crosslet saltirewise betw. four estoiles or. Crest— A cubit arm erect vested bendy of six az. and sa. cuff ar. the hand ppr. holding a crosier and surmounted by an estoile both or. Motto—Deo duce. Bailey – (Ightham Place, and Nepicar House, co. Kent). Erminois a lion pass. sa. holding in the dexter paw a cross pattee fitchee gu. on a chief nebulee of the second a cross pattee, or. Crest—In front of a demi lion erminois holding in the dexter paw a cross pattee fitchee gu. the trunk of a tree eradicated fesswise and sprouting ppr. Motto—Nec temere nec timide. Bailey – Erm. three bars wavy sa. Crest— A demi lady holding on her dexter hand a tower, in her sinister a laurel branch vert. Bailey – (Bart, of Glanusk Park, co. Brecon). Ar. betw. two bars, three annulets in fesse gu. all betw. as many martlets of the last. Crest—A griffin sejant ar. semee of innulets gu. Motto—Libertas. Bailey – (Stretford, co. Lancaster). Gu. on a fesse nebuly betw. four martlets three in chief and one in base ar. two roses of the first barbed and seeded ppr. Crest—In front of an anchor in bend sinister ppr. a female figure vested vert aupporting with the right hand an escocheon gu. charged with a martlet ar. and resting with the left on the stock of the anchor. Motto—Vallum aeneum esto. Baille – Provence – Dominique , bourgeois de la Cadière. D’azur à un coeur d’or surmonté d’une croisette du mesme au chef de gueules chargé de trois étoiles d’or. English: Azure with a heart or, surmounted by a crosslet of the same, a chief gules, charged with three etoiles or. Baille – Provence – Famille de Seyne et de Vernet, inscrite dans l’Arm. gén. de 1696 : Jean-Antoine , notaire; Antoine , bourgeois; Joseph , marchand. D’argent à trois hures de sanglier de sable défendues du champ. English: Argent three boar head sable, tusked of the field. Baille – Provence – Joseph B. cabaretier à Toulon – D’argent à un arbre terrassé de sinople le fût accosté de deux roses de gueules chaque rose surmontée d’une étoile d’azur. English: Argent a tree on a mount vert, the trunk having to the sides two roses gules, each rose surmounted by an etoile azure. Baille – Provence – (Arm. gén. 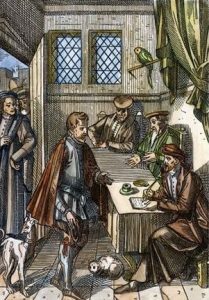 de 1696) Antoine , pelletier à Toulon. De gueules aux lettres A et B en pointe surmontées d’une croix pattée et deux points accostant le B le tout d’or. English: Gules the letters A and B in base, surmounted by a cross pattee and two points on either side of the B, all or. Baille – Guyenne, Gascogne – (Bach. Defl) – De sable au chevron d’or acc de trois besants du mesme. English: Sable a chevron or, accompanied by three bezants of the same. Baille – Narbonne – D’or à la bande de gueules chargée de trois étoiles d’argent acc en chef d’une main l’index allongé issant en barre d’une nuée mouvant de l’angle senestre du chef et en pointe d’une tige fleurie d’une pièce et de quatre boutons English: Or a bend gules, charged with three estoiles argent, accompanied in chief by a hand pointing, issuing in bend sinister from a cloud coming out of the sinister chief angle of the shield, and in base by a stem flowered with four buds. Baille – Provence – De gueules à six billettes d’or posées 3 2 et 1 English: Gules with six billlets or, arranged 3, 2 and 1. Baille – (du) – Normandie – D’azur à deux chevrons d’or acc en chef de deux étoiles d’argent et en pointe d’une rose du même. English: Azure two chevrons or, accompanied in chief by two etoiles argent, and in base by a rose of the same. Bailles – (Yorkshire, granted 1578). Or, a fesse wavy az. betw. two lions pass. guard. sa. Baillie – (Kennedy-Baillie: exemplified, 1836, to Rev. James Kennedy-Baillie, D.D.. Rector of Ardtrea, Armagh, on his assuming by Royal Liccnse the additional name of Baillie). Quarterly, 1st and 4th, az. nine etoiles three, three, two and one, for BAILLIE; 2nd and 3rd, ar. a chev. gu. betw. three cross-crosslets fitchee sa. within a double tressure flory counterflory of the second, for KENNEDY. Crests—1st, A boar’s head couped ar., for Baillie: 2nd, A dolphin naiant az. Motto—Quid clarius astris. Baillie – (Hoperig, co. Haddington, and Lamington, co. Lanark). Az. (in some early blazons, sa.) nine stars three, three, two, and one, ar. Crest—A boar’s head erased ppr. Motto—Quiil clarius astris. v. Cochrane. 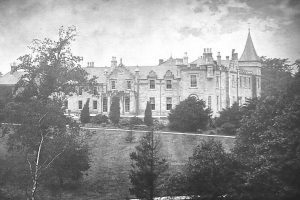 Baillie – (Jervieswoode, co. Lanark; the heiress m. Lord Binning, and her 2nd son, who inherited Jervieswoode, took the name of Baillie: his descendants eventually succeeded to the Earldom of Haddington). Sa. the sun in his splendour betw. nine stars, three, two, and one, ar. Crest—A crescent or. Motto—Major virtus quam splendor. Baillie – (Walstoun, Scotland). Ar. the moon in her complement betw. nine stars, three, two, three, and one, ar. Crest—A dove volant holding in her beak a branch of olive ppr. Motto—Patior et spero. Baillie – (Mannerhall). As. Jervieswoode, a crescent ar. for difference. Crest—A crescent or. Motto—Major virtus quam splendor. Baillie – (Cairnbroe, co. Lanark, 1780). Sa. the sun in his splendour betw. five stars two, two and one, ar. in middle chief an eagle’s head erased or. Crest—On the point of a sword erected ppr. hilted and pommeled or, a laurel wreath fructuated of the first. Motto—Perseveranti. Baillie – (Polkemmet, co. Linlithgow, bart., 1823). Quarterly, 1st and 4th, az. nine stars three, three, two, and one or, a bordure counter nebuly ar. and sa. ; 2nd and 3rd, az. a lion ramp. and in chief three stars ar., INGLIS of Murdistown. Crest—A star of eight points issuing out of a cloud ppr. Supporters—Two lions guard, ar. Motto—In caligine lucet. Baillie – (Innishargy, Ireland). Az. nine stars, three, three, two and one ar. a bordure wavy or. Crest—A star of eight points ar. issuing from a cloud ppr. Motto—Nil clarius astris. Baillie – (William Baillie, of Rosehall, co. Sutherland, son of Alexander Baillie of Dochfour, 1747). Az., nine stars, three, three, two and one. ar., a bordure or, charged with ten cinquefoils vert. Crest—A cat sejant ppr. Motto—Spero meliora. Baillie – (Gen. Sir Evan Baillie, Bart., 1812). Az. nine stars, three, three, two and one, ar. Crest—A boar’s head erased ppr. Supporters—Two tigers ppr. each gorged with an antique crown or, and thereto affixed a chain passing betw. the forelegs and reflexed over the back of the last. Motto—Ubi bene ibi patria. Baillie – (Monkton, co. Ayr, 1874). Az. nine stars three, three, two and one, or, a bordure engr. ar. Crest—An eagle reguardant his wings raised ppr. Motto—Libertas optima rerum. Baillie – (Paignton, co. Devon, 1855). Az. nine stars of six points wavy three, three, two and one, or, a bordure of the last charged with two boars’ heads erased in pale and two hands holding daggers erect in fess all ppr. Crest—A boar’s head couped ppr. Motto—Quid clarius astris. Baillie – (Balmeddiesyde, Scotland). Az. nine stars or, three, three, two and one, a bordure ar. charged with eight crescents of the first. Crest—A morning star ppr. Motto—Vertitur in lucem. Baillie – (James Baillie, descended of Littlegill, 1763). Az. nine stars, three, three, two and one ar., a bordure indented of the second charged with eight stars gu. Crest—A boar’s head erased ppr. Motto—Quid clarius astris. Baillie – (William Robert Baillie, Edinburgh, 1858). Az. eight stars three, two, two and one, or, in fess point a stag’s head cabossed of the last, a bordure erm. Crest—The sun in his splendour ppr. Motto—Clarior astris. Bayley – (Thomas Butterworth Bayley, Esq., of Hope Hall, Sheriff of Lancashire, 1768). Ar. on a fesse betw. three martlets gu. as many plates. Bayley – (Oxfordshire). Gu. three martlets or, a chief vair. Bayley – (formerly of Chesterton, co. Huntingdon, bart.). Quarterly, gu. and erminois on a fesse az. three martlets or, betw. in the first and fourth quarters a lion ramp. ar. Crest—On a mount vert behind a wall ar. a lion ramp. also ar. Bayley – (Hoddesdon, co. Herts, 1634). Ar. three torteaux two and one, a chief gu. Crest—Out of a ducal coronet or, a nag’s head ar. Bayley – (London). Gu. a fesse vair, in chief a bezant, charged with an anchor sa. betw. two estoiles in base three martlets ar. Crest—A dexter arm embowed habited az. on the arm a fesse vair the hand ppr. supporting a staff or. Bayley – (Middle Temple). Sa. a chev. between three human hearts or. Crest—A demi lion guard. or. holding in the paw a branch vert. Bayley – Ar. on a fesse betw. three martlets gu. as many plates (another, bezants). Crest—A griffin sejant erm. wings and fore legs or. Bayley – Az. nine estoiles ar. three, three, and three. Crest—A boar’s head erased ppr. Bayley – Gu. a chev. engr. erm. betw. three martlets ar. Bayley – (Northallerton, co. York, previously of Easingwold, in that county, and originally from the South of England; borne by Charles John Bayley, Esq., London, late of Trinity College, Cambridge). Ar. on a fesse betw. three martlets gu. three bezants, quartering Barry (formerly the patronymic of the family). Crest—A griflin sejant erm. wings and fore legs or. 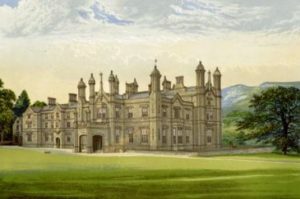 Bayly – (Plas Newydd Anglesey, bart. ; now represented in the male line, by the Marquess of Anglesey). (Ballyarthur, co. Wicklow, descended from Lambart Bayly, 3rd son of Sir Edward Bayly, first bart. of Plas Newydd, co. Anglesey). Az. nine estoiles, three, three, two, and one, ar. Crest: A boar’s head erased ppr. Motto: “Quid clarius astris”. Bayly – (Bristol). Or, on a fesse engr. betw. three nags’ heads erased az. as many fleurs-de-lis gold. Crest—A goat’s head az. bezantee attired or. Bayly – (London). Gu. a fesse vair betw. two mullets of six points in chief, and a heart in base or. Crest—An arm couped at the elbow and erect, habited gu. charged with a fesse vair, the cuff ar. holding in the hand ppr. a mullet of six points or. 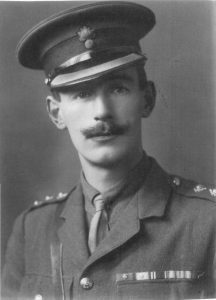 Bayly – (Major Sir Henry Bayly. K.H., second son of Zachary Bayly, Esq., of Bideford, by his wife, the youngest dau. of L. Clutterbuck, Esq., of Newark Park, co. Gloucester). Or, on a fesse engr. betw. three nags’ heads erased az. as many fleurs-de-lis gold. Crest—Out of a ducal coronet or, a nag’s head ar. Bayly – Ar. a chev. ermines betw. three mullets gu. (another, martlets). Bayly – Ar. three torteaux, two and one. Bayley – (alias Godeman) (Ireland). Gu. on a cross ar. five greyhounds’ heads erased sa. in the first quarter a covered cup of the second. Bailie – (Ringdufferin, co. Down). Az., nine stars, three, two, and one, ar. Crest—A hand and dagger. Motto—Quid clarius astris. Baylie – Az. three doves rising ar. legged gu. ana crowned with ducal coronets or. The name Bailey has three origins. One is from the occupation of steward, from the Old French “balif” and middle English “bail”. It eventually developed in to “Bailie” in Scotland, meaning municipal magistrate, or “baliff” in England, meaning officer of the court. Secondly, it came from where they made their home, in this case, near the outer castle walls, or “bail(l)y” in middle England. Lastly, it came from the town they lived in, “Bailey”, in Lancashire, meaning “berrywood”. The first record of the family name is Roger le Baylly, dated 1230, in the Suffolk Pipe Rolls, during the reign of Henry III. The Bailey lineage was created by a certificate granted by Sir Charles Erskine (Lyon King-of- Arms), dated 28 June, 1676, confirming to Thomas Baillie the family coat of arms and motto, it is stated that the Baillies of Pulkemmet are descended from the Ballies of Jerristowne, who were descended from the Baillies of Carphin, who were cadets of the Baillies of Lamingtoune. Thomas, his heir; James who married Catherine Hamilton of Airdrie in 1642; Elizabeth who married Thomas Hamilton, of Boghead in 1647; and Katherine, who married John Sommerville in 1643. The oldest son, Thomas Baillie, married Alison, daughter of Sir James Muirhead of Lauchop, and had issue: Thomas, his heir; and Margaret, married Robert Flemyng of Ravens Craig, Lanarkshire in 1654. The only son, Thomas Baillie married Margaret, daughter of William Baillie, of Carphin in 1644, and had issue: Thomas, John, and Jean. The lineage of Bayley—Isaac Bayley, of Huntingdon, son of Daniel Bayley, and grandson of Philippe Bayley (or de Bailieui, Seigneur of Eecke), who emigrated from Spanish Flanders to escape persecution in the 17th century, bought Willow Hall, at Thorney, near Peterborough. He married Orme, daughter of Henry Bigland of Leicester in 1732, leaving issue: Edward (Rev. ); rector of Courtenhall, Northhampton, m). thrice: leaving issue; John, the heir; Charles, of Peterborough, married Cordelia, daughter of Samuel Taylor; Henry, of Uppingham, married Elizabeth, daughter of John Sly, of Huntingdon, and had issue; and Isaac, of Market Harborough, married Mary, daughter Rev. George Widowson, and had issue. His 2nd son, John Bayley, of Northampton, married Sarah, daughter and heir of White Kennett, leaving issue: Daniel who died unmarried; John, the heir; Saul who died unmarried; Edward who died unmarried; and Basil Kennett who died unmarried. The 2nd son, The Rt. Hon Sir John Bayley, a lawyer of eminence, was for many years one of the Judges of the king’s bench, and subsequently a baron of the Exchequer. He was knighted in 1808, and created a baronet on his retirement in 1834. He married Elizabeth, daughter of John Markett, of Kent in 1790, and by her had lssue: John Edward George (Sir). 2nd baronet; Kennett Champain (Rev) rector of Copford, Essex, married in 1831 to Charlotte, daughter of James Drake Brockman, of Beachborough, Kent, having had issue. Early settlers to America include Richard Bailey (Massachusetts 1650), from the company that set up the first cloth mill in America; John Bailey (Massachusetts 1939); John Bayley (Massachusetts 1635), a weaver. The Baillie family motto is in caligine lucet, from the family crest, meaning “It shines in the darkness”. The Bayley family motto is virtus simper viridis, meaning “Virtue is always flourishing”. Famous people with this last name include: 1) Jacob Bailey (1731–1808), Church of England clergyman and author; 2) Benjamin Bailey (1791–1871), British missionary in India; 3) Charles Bayly (17th century), the first overseas governor of the Hudson’s Bay Company; and 4) Baillie of Jerviswood (died 1684), Scottish conspirator.